I acquired this pen going on almost 6 months ago from Appelboom, but have yet to give it any exposure or fanfare... timing, right? It has now been over two years since my first review of the Montblanc M series, at that time the fountain pen version. In a way I had a bit of a love/hate relationship with the "M", but ultimately the design has won out on me. When I saw that Montblanc would be releasing an alternate Ultra Black lineup of the pen I knew I'd likely be picking one up at some point... but, not a fountain pen. Montblanc is one of those brands that "pen people" seem to either adore or despise. Traditionally highly priced and seen often as a status symbol, it is understandable how it might come with some strong opinions. I feel a bit in between as I know that the pens are highly priced (and really well marketed apparently), but feel like they are just one of those things that I knew I didn't need but would likely end up buying considering the Montblanc name and heritage. Nobody "needs" even a $10 pen when a $0.25 pen will suffice, but that isn't really why we do what we do in this community, right? The original M series came in a glossy, piano black barrel; very fancy and posh. What you'd expect from a Montblanc I think. 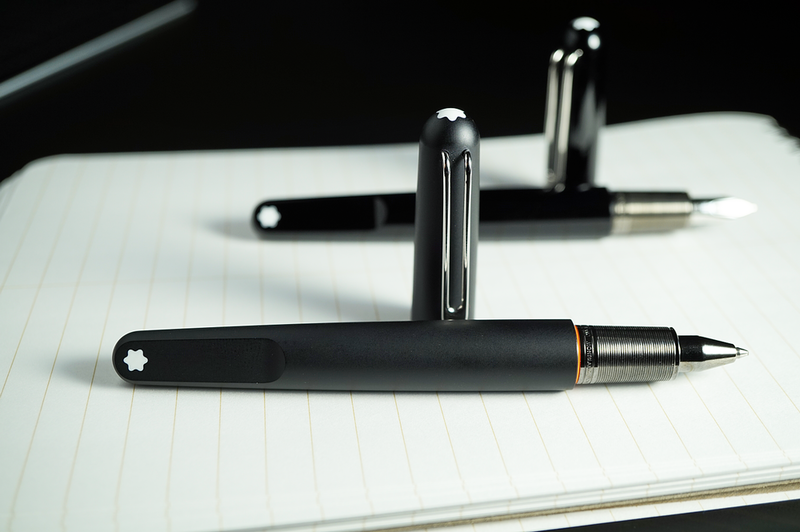 For the Ultra Black series they took the lovely resin and sand blasted it to a matte texture and incorporated elements of bright orange color into the components of the pen which is a stark contrast. It certainly took the M on a more edgy ride for sure, but it is what I think I liked about it. It is definitely still "business", but with some attitude. If you know me personally, this pen is about as far from how I show up in real life, but perhaps that is what makes it fun. For round two with the M I opted to purchase the ballpoint version as something I could use in more circumstances. If you've noticed over the last couple of years that fountain pens have shown up less and less in reviews it is due to how I write nowadays. I still love fountain pens, but don't use them as daily writers as often so for my personal purchases I find that I am not getting as many. One of the features that makes the M unique is its magnetic cap system. No threads or pop on experience; just put the cap onto the section and it snaps into place. It also magnetically holds onto the end of the pen while posting which is neat. On the original fountain pen I reviewed I found the alignment that the magnet created with the clip and flat cutout section seemed to be a bit more precise. The Ultra Black clip sways a little to the left which does drive me a bit nuts. This is no doubt something I can get adjusted within the cap, but have yet to take action on it. The Montblanc ballpoint refill is probably one of the better ones I've used as it is smooth and pretty inky, but it is a ballpoint experience for sure. Comparing to a Jetstream, InkJoy, or other more specialty refills it may not be that strong of a comparison, but it is still enjoyable. Although, I've been super tempted to try one of these 3D printed adapters which would allow for a D1 to be swapped in... if I do, I'll report back. While writing the tip doesn't move at all which, for me, makes up much of any rollerball or ballpoint experience. The section is metal and finished in an ionized, titanium nitride type plating that gives it a dark grey, almost-black type of appearance which goes nicely with the aesthetic. The grip is made up of about 40 tightly machined rings that are toothy, but not sharp in my opinion. In my previous review of the fountain pen I mention that there is a sharp step from the barrel to the grip which for many people I'd imagine would be uncomfortable. With how I hold pens in a traditional "triangle" grip the only place the step even touches my hand is right at the end of my thumb, and in a more subtle way. In short: not an issue for me, but probably will be with some folks. If this pen is interesting to you it may be one to try and see in person if possible before buying. As mentioned above, one thing they've done is replaced the normal, metal grip threading components with bright orange plastic. I love the look of this. The switch in material does adjust the weighting slightly, but it does look pretty cool. One of those unnecessary things, but takes things a bit out of the more conservative class. My experience with Appelboom was wonderful (I will note that they are a site sponsor) and I received the pen well packaged coming from the Netherlands AND gift wrapped. This isn't something they just did for me, but do it on all of their shipments. I have found that Appelboom tends to carry some models that aren't easily found in the states so I'd definitely give them a look. Is the M a pen I could see myelf recommending to most people? Probably not one of my first thoughts at all, but if someone is looking for an interesting "fancy" pen, I wouldn't put this one out of the lineup.